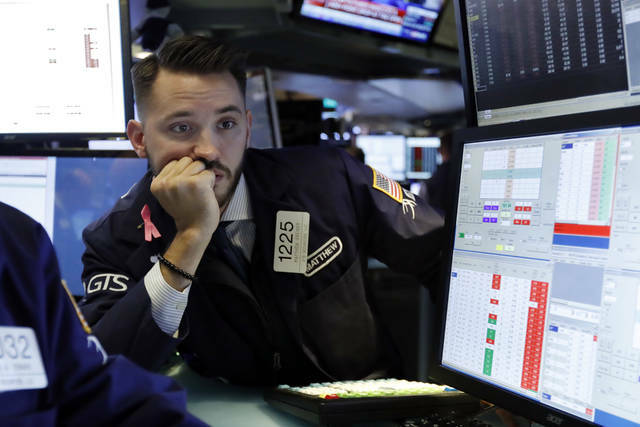 NEW YORK (AP) — A turbulent day on Wall Street ended Tuesday with stocks climbing nearly all the way out of a steep, broad sell-off that at one point erased more than 500 points from the Dow Jones Industrial Average. Even with the late-afternoon rebound, stocks extended the market’s recent string of declines, giving the benchmark S&P 500 index its fifth-straight loss. Bond prices rose, sending yields lower, as investors sought out safer investments. Hong Kong’s Hang Seng index sank 3.1 percent. European markets also closed sharply lower. The latest selling came as investors grew unsettled over slowing economic growth in China and increased signs that President Donald Trump’s aggressive trade policies are beginning to weigh on corporate earnings. Caterpillar and 3M slumped Tuesday after the companies warned of rising costs related to tariffs. The S&P 500 fell 15.19 points, or 0.6 percent, to 2,740.69. The Dow lost 125.98 points, or 0.5 percent, to 25,191.43. The average had been down more than 540 points. The Nasdaq slid 31.09 points, or 0.4 percent, to 7,437.54. The Russell 2000 index of smaller-company stocks gave up 12.91 points, or 0.8 percent, to 1,526.59. The index is now down for the year. Recent data show China’s economic engine is growing more slowly. From July to September, it grew 6.5 percent, the slowest pace since early 2009. The world’s second-largest economy was cooling even before the outbreak of a tariff war with Washington. That contrasts with the momentum of the U.S. economy. The government is expected to say Friday that the U.S. economy grew by 3.3 percent in the third quarter, after growing by 4.2 percent in the second quarter. The strong U.S. economy has helped power earnings growth for companies in the S&P 500. While those companies are expected to deliver 21.9 percent earnings growth for the third quarter, according to S&P Global Market Intelligence, investors are concerned about future growth amid rising inflation, interest rates and uncertainty over trade. Caterpillar skidded 7.6 percent to $118.98 after the heavy equipment manufacturer warned that Trump’s taxes on imported steel were driving up production costs. 3M fell 4.4 percent to $192.55 after its earnings missed Wall Street’s targets. The industrial manufacturer said it expects raw material prices to continue climbing, and for tariffs to have a roughly $100 million negative impact on the company’s sourcing costs next year. Losses in banks, energy and technology companies outweighed gains by internet and consumer-goods stocks. A sharp sell-off in Chinese and other global markets set the stage for the volatile day on Wall Street. Computer-driven trading, which uses algorithms to guide buying and selling, likely drove the gradual, partial rebound toward the end of the day, said Quincy Krosby, chief market strategist at Prudential Financial. “On the downside and the upside the algorithms are going to kick in and they really push the market in one direction or another,” Krosby said. A big drop in oil prices weighed on energy stocks Tuesday. Marathon Oil dropped 4.8 percent to $19.48. Truck maker Paccar fell 5.1 percent to $57.40, while engine manufacturer Cummins slid 3.8 percent to $134.64. Traders also bid up shares in McDonald’s after the fast-food chain reported third-quarter results that topped analysts’ forecasts. The stock gained 6.3 percent to $177.15. Tesla was among the big gainers Tuesday. The stock vaulted 12.7 percent to $294.14 after Citron Research, a company that for years had bet against the stock, reversed its position and put out a note saying it would be a long-term investor in the electric car and solar panel company. U.S. crude fell 4.2 percent to settle at $66.43 per barrel. Brent crude, used to price international oils, dropped 4.2 percent to close at $76.44 per barrel. Heating oil slid 3 percent to $2.25 a gallon. Wholesale gasoline lost 3.7 percent to $1.84 a gallon. Natural gas gained 2.4 percent to $3.21 per 1,000 cubic feet. In Europe, the focus was on Italy’s dispute with the European Union over its plan to ramp up public spending. The European Union has rejected Italy’s budget, a first for an EU member. Germany’s DAX slid 2.2 percent and France’s CAC 40 fell 1.7 percent. Britain’s FTSE 100 lost 1.2 percent. Japan’s Nikkei 225 index fell 2.7 percent and the Kospi in South Korea tumbled 2.6 percent.